1. In a bowl, combine ground beef, egg, garlic, breadcrumbs, salt and pepper. Mix thoroughly. 2. Divide the mixture into serving pieces. Roll the mixture into balls and flatten on an even surface. 3. grill or fry patties until color turns to light brown. Drain on paper towels and set aside. 1. In another pan, heat oil then melt butter. 2. Add sliced mushrooms and saute for 1 minute. 3. Pour beef stock then bring to boil. 4. Add flour then season with salt and ground pepper. 5. Stir constantly until the sauce reaches the desired thickness. 1. 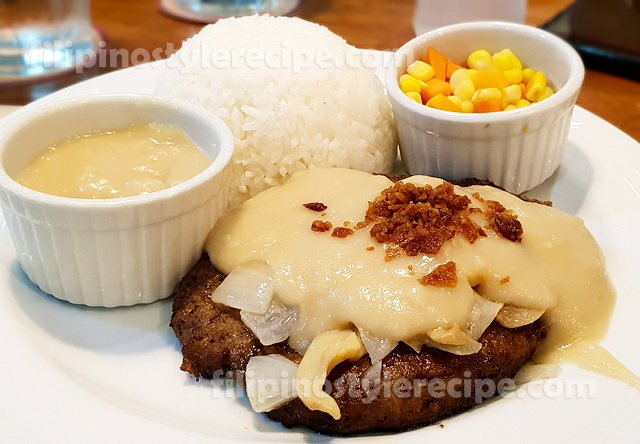 Arrange the patties into serving plate then pour with mushroom gravy. 2. Serve with steamed rice and mixed veggies. 1. In a bowl, combine Parmesan Herb mixture. Set aside. 1. Lined baking pan with aluminum foil then grease with olive oil. 2. Arrange salmon then season with salt and pepper. Bake in a preheated oven over 350 degrees Fahrenheit for 10 minutes. 3. Remove from oven then top with Parmesan Herb mixture. 4. Return to oven then bake for 200 degrees Fahrenheit until then cheese melted and light brown. 1. Season salmon with lemon juice, salt and pepper then set aside for 15 minutes. 2. In a separate bowl, combine sauce mixture then mix well. 1. In a pan, heat oil then fry salmon until light brown. 2. Pour the sauce mixture then simmer until reduced and thickens. 3. Transfer into serving plate then drizzle with remaining sauce. 4. Sprinkle with chopped parsley then serve with steamed beans. 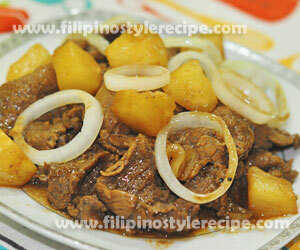 Filipino Style Recipe: Pininyahang Bistek is another mouthwatering and delicious beef dish. We innovate the dish by adding pineapple for maximum flavor. The meat is marinated for several hours then stir fry until just cooked. Then topped with onion rings together with the sauce. 1. Marinate meat in lemon juice, garlic, soy sauce and ground pepper for an hour or overnight inside the fridge. 1. In the same pan, add the marinated meat then stir-cook over high heat for 5 minutes or until just cook. (Don’t overcook, meat will become tough and rubbery). 2. Transfer the meat to a serving plate then set aside. 3. In the same pan, pour the marinated, onion, oyster sauce, pineapple and pineapple juice then bring to boil. 4. Add dissolved cornstarch, salt and pepper to taste then simmer until reduce in half. 5. Pour the sauce over meat then garnish with onion rings. 6. Serve hot and enjoy! 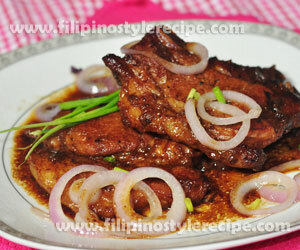 Filipino Style Recipe: Pork chops steak or bistek is another mouth watering Filipino dish inspired to western beef steak. 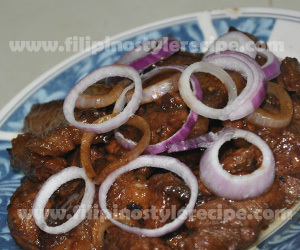 Pork chop steak or bistek is another variety of pinoy bistek tagalog. Pork chops should marinated then cooked until tender. This dish is usually serve with sauce on top and garnish with onion rings. 1. Pound the meat with a meat pounder then marinate in calamansi, soy sauce, garlic, sugar, salt and pepper for at least 3 hours or overnight inside the fridge. 1. In a pan, heat oil then melt butter over medium heat. Lightly fry the onion rings for a few seconds then drain and set aside. 1. In the same pan, fry marinated pork chops for 5-8 minutes each side. Drain and set aside. 2. Clean the pan then add a little oil, marinade and water then bring to boil. 3. Adjust season according to taste then simmer until reduce in half. Remove from heat. 4. Arrange pork chops in a serving plate then pour sauce on top. 5. Garnish with onion rings and spring onions then serve with steamed rice or potatoes. Enjoy! 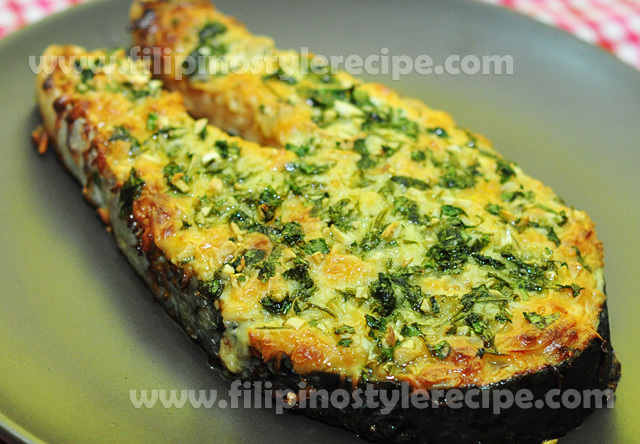 Filipino Style Recipe: milkfish steak or bistek tagalog na bangus is another variety of steak(bistek) dish. The fish marinade and fry until golden brown. Then re-cooked in marinade together with onion rings. 1. 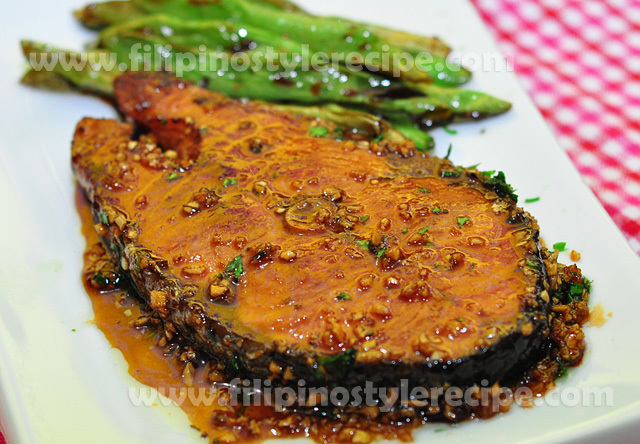 Marinate milkfish in calamansi juice, soy sauce, garlic, ginger, salt and pepper for 30 minutes. 1. In a pan, heat oil then lightly fry onions for a minute. Drain and set aside. 2. In a same pan, fry marinated fish until crisp and golden brown. Drain and set aside. 3. In a same pan, reduce oil then saute garlic and ginger. 4. Pour marinade then adjust seasoning according to taste. 5. Put back fried fish and fried onions then simmer for a few seconds. 6. Remove from heat then transfer to serving plate. Serve with garlic rice. Filipino style recipe: chicken steak or chicken bistek tagalog is normally the chicken marinade and stir fried until tender and garnish with onion rings. This is similar to beef steak and pork steak. Estimated time of preparation and cooking: 40 minutes. 1. In a bowl, combine chicken, calamansi, garlic, soy sauce, salt and pepper. Marinate for 30 minutes inside the fridge. 3. In the same pan, Add the marinated chicken, stir-fry until tender and start to sizzle. 4. Transfer to a serving platter including the oil and sauce. 5. Garnish with onion rings. 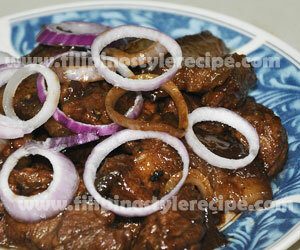 Filipino style recipe: pork steak or pork bistek tagalog is pork dish. 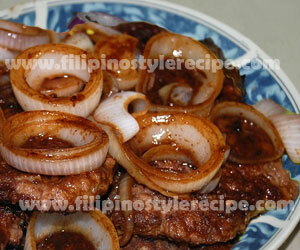 Normally the pork marinade and stir fried until tender and garnish with onion rings. This is similar to beef steak. Estimated time of preparation and cooking: 50 minutes. 1. In a bowl, combine pork, calamansi, garlic, ginger, soy sauce and pepper. Marinate for 30 minutes inside the fridge. 3. In the same pan, Add the marinated pork, stir-fry meat until cooked and tender. 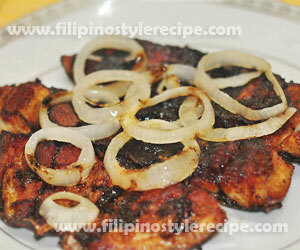 Filipino Style Recipe: grill fish steak recipe is normally the fish fillets marinade then grill on high heat until done. Serve with any sauce you desired, I prefer tartar sauce. 1. In a large bowl, combine olive oil, garlic, salt, ground pepper, lemon juice, basil and parsley. 2. Add fish fillets and marinade in refrigerator for 30 minutes, turning occasionally. 1. Preheat the grill 4 inches from high heat then brush lightly with oil to prevent sticking. 2. Grill fillets for 5 minutes each side or until fillets is done. 3. Transfer the fillets to serving plate with tartar sauce. Estimated time of preparation and cooking: 50 minutes. Good for 3-4 persons. 1. Marinate meat in lemon juice, garlic, ginger, soy sauce and ground pepper for 30 minutes. 3. In the same pan, Add the marinated meat, stir-fry meat until cooked and tender.